CHANDLER, Ariz., Aug. 6, 2014 [NASDAQ: MCHP] — Microchip Technology Inc., a leading provider of microcontroller, mixed-signal, analog and Flash-IP solutions, today announced the new PIC32 Bluetooth® Starter Kit. The full-featured kit boasts a PIC32 microcontroller (MCU), HCI-based Bluetooth radio, Cree high-output multi-color LED, 3 standard single-color LEDs, an analog 3-axis accelerometer, analog temperature sensor and 5 push buttons for user-defined inputs. Additionally, a PICkit™ On Board (PKOB) which eliminates the need for an external debugger/programmer, USB connectivity and GPIOs for rapid development of Bluetooth Serial Port Profile (SPP), USB and general-purpose applications. The starter kit also features a plug-in interface for an audio CODEC daughter card which is set to release at a later stage to support Bluetooth audio. 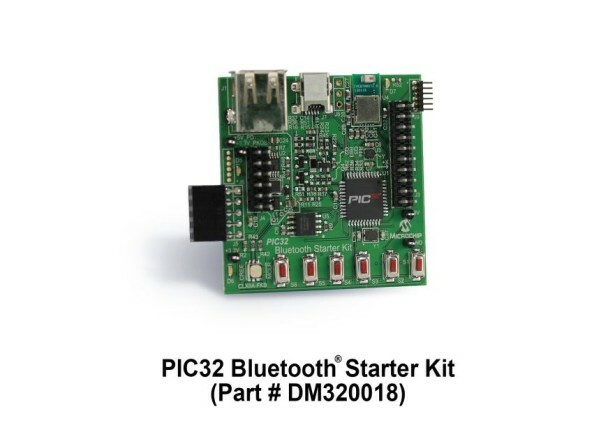 The Bluetooth Starter Kit includes a PIC32MX270F256D MCU for main processing that runs at 83 DMIPS with 256 KB Flash and 64 KB RAM with a rich feature set including USB, I2S/SPI, mTouch® capacitive touch sensing and an 8-bit Parallel Master Port. The kit reduces software development time by offering a free Bluetooth SPP stack optimized for the on-board PIC32 MCU for setting up emulated serial port connections between two peer Bluetooth devices. The PIC32 Bluetooth Starter Kit is supported by Microchip’s free MPLAB® X Integrated Development Environment (IDE) and MPLAB Harmony Integrated Software Framework. Additionally, the free Quick Start Package is available today, featuring an Android™ application development environment. It also includes a free Software Development Kit (SDK) with the application source code and binary for Microchip’s Bluetooth SPP library. Both are optimized for the on-board PIC32 MCU, and are available today via free download under the Documentation & Software section at http://www.microchip.com/get/1AVL.